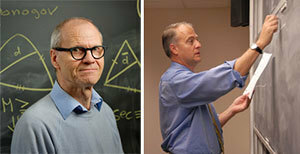 Karsten Grove and Matthew J. Gursky of the Department of Mathematics at the University of Notre Dame were among 63 recently announced Fellows of the American Mathematical Society for 2015. In its third year, the program honors society members who have made exceptional contributions in mathematics. Grove, the Rev. Howard J. Kenna, C.S.C., Professor of Mathematics, was recognized for contributions to Riemannian geometry. His research focuses on modern differential geometry including topics from closed and isometry invariant geodesics to the construction of important new examples of manifolds with positive curvature. His findings on the nonlinear center of mass and critical point theory for distance functions have made him an international leader in the field. His “Grove Program,” which is used to classify positively curved manifolds by their symmetry group, has become a flourishing research area. The American Mathematical Society, founded in 1888, launched the Fellows program to expand the number of recognized mathematicians by their peers as distinguished for their contributions to the profession. Notre Dame professors William G. Dwyer, Julia F. Knight, Mei-Chi Shaw, Andrew J. Sommese and Nancy K. Stanton were selected as members of the society’s inaugural class of Fellows. Originally published by Gene Stowe at news.nd.edu on November 19, 2014.